NAGASAKA Aki Created with the grasp of hands, it began to deteriorate in the midst of formation. 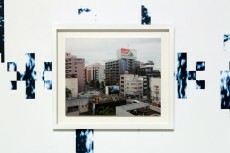 What would remain as its traces..., project, 2014. 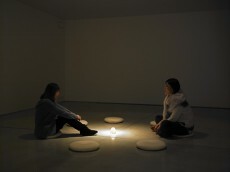 NAGASAKA Aki’s work begins with ideas inspired by her personal experiences―encounters with people, things and events, and she tries further to increase their depths by probing into the cultural and historical background of what are stemming from them. Interweaving reality, experience, recollection and imagination, she develops a narrative world in which actuality and imagination are mingled. This world is expressed not only in texts but also in a variety of media such as objets d’art, images, sounds and photographs. In addition, the world is not only what the artist tells us one-sidedly, but it also functions as a “stage setting” in which each viewer can think of their original stories. The work produced this time is the prologue 00_Scape and the first chapter 01_Angus within a larger frame of story titled “Created with the grasp of hands, it began to deteriorate in the midst of formation. What would remain as its traces...” It means that this piece will add more chapters from now on in some sort of form, and the piece presented here is a part of a larger production world whose construction is underway. A narrative-centered work is composed of two elements; a physical piece of work and a story told by the artist’s voice. 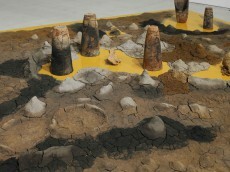 In 00_Scape was created a “landscape,” which reminds us of the dried ground made with clay and Jomon pottery placed on a yellowish brown pedestal. Being arranged on the pedestal, it appears to be a closed land cut off from reality. Craters and protrusions made of dried earth suggest ruins. Jomon pottery, which is made by combining and rearranging broken pieces of earthenware and strikes us as traces of ancient people’s hands, is reminiscent of the lost civilization. There, a mythical story of “figures made with clay” (humans) is dubbed in an intimate, whispery voice. 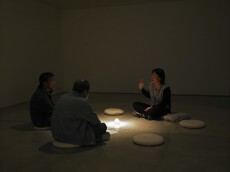 In this work, a story connecting present-day customs to the events in the age of gods, the objects made by “Jomon people and the artist,” who are separated afar on the time axis, using earth as well as gathered from the same land, are arranged on the same plane. 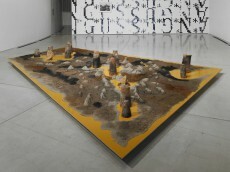 By forming a place on the hyperspace pedestal, this work indicates the neutral map of the narrative world. 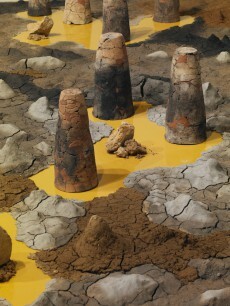 01_Angus is said to be one of the characters created by the artist as a resident of this clay landscape. It could also be a photographer of Scottish descent whom the artist once met, one of gods in Irish myth, a kind of cattle, a name of some place, as well as Acoustically Navigated Geological Underwater Surveyor (ANGUS). That is to say Angus is the keystone, which made plural coincidences around the artist inevitable, and it is also a symbol. The artist’s performance of “storytelling” is the main part of this work, and the physical installation is made as a “room” for telling the story, which begins with photographer Angus and ends with acoustically navigated geological underwater surveyor Angus. 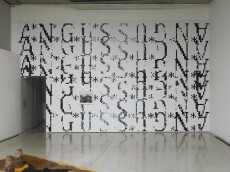 Going through a large wall covered with typography of A-N-G-U-S letters and a photograph, visitors enter a small room in which tiny wooden object is placed in the center, and they listen to the story. Here, completely different from 00_Scape, the story is told in an ordinary manner. It is as if they were listening to their friends chatting about their recent experiences or thoughts sitting around a campfire. Both ANGUSes actually exist---one is “elf-like” ANGUS in the story who is searching for the ideal scenery in the North Pole, and the other is ANGUS whose figure can hardly be identified now either in a photograph or a real thing in spite of many great discoveries made to expand human knowledge. They seem to be somewhere on the border of reality and unreality. Their journey to head for a frontier looking for scenery yet to be found seems to be a journey to look for something beyond memory or in the bottom of one’s heart rather than real traveling. On the other hand, ANGUSes are not considered traveling merely to look for the mental landscape, but they are opening up people’s world in reality and as a metaphorical expression by bringing back and presenting what has been discovered to share images and knowledge with people. ANGUS, which is the equipment of a simple mechanism, has found something where nothing was expected to exist, and its photograph (=image) changed human recognition. A photographer who is looking for a landscape that goes straight to his heart finds that the more he seeks a suitable scenery, the less his opportunity of taking a picture becomes. And he does not know how and with whom he can share a scenery seen in an instant, which he has finally obtained after all conditions are met. It overlaps exactly with a question concerning art production. In this respect, everything that is told here seems to be all questions about art production. It is the essence of art that Nagasaka is thinking of and a narrative concerning its values rather than an art theory for its own sake. Nagasaka’s persistent efforts of “objective” research made this piece possible. However, the research was made extremely subjectively: she herself selects accidental events through her personal experiences, deepens further those happenings that are connected based on her own viewpoint, and lets them lead her to other happenings. The reason why her story has become neither personal nor introverted is that her research, coming to terms with facts and others’ ideas, not only firms up the connection between her subjective happenings and events, but also explores to find the horizon, which can be shared with others. The landscape and story constructed on repeated subjectiveness are expressed neither as a landscape in her mind with a series of personal feelings and memories, nor as a symbol that emerges from an unconscious archetype. That is felt in the artist’s expression of her attitude to try to reach universality after repeating subjective pursuit. If we feel that scattered things seem to be connected together as a matter of certainty, it is when unconsciousness reacts to the surrounding world and a different truth rises up. However, knowing it takes some getting used to. 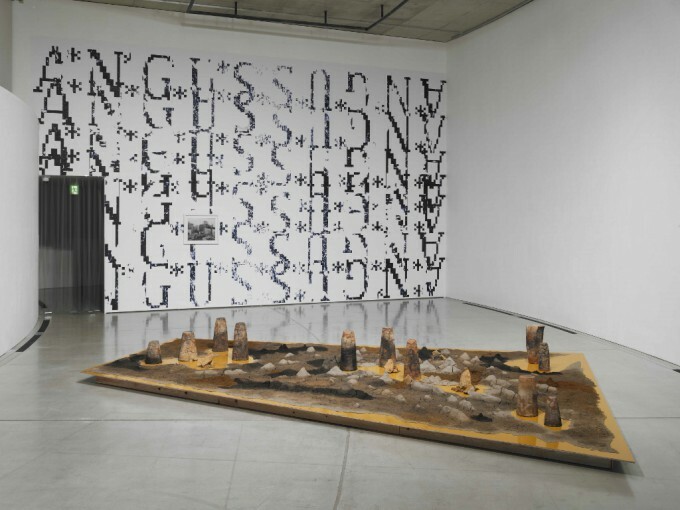 When coming out of the small room, visitors who listened to the story may see a different image on the typographic letters on the wall, or notice the image of ANGUS in the center of the photograph, which they first took for a picture of an ordinary cityscape. If one’s experience changed his or her viewpoint, an image in between the visible and the invisible would emerge in front of us, and the world surrounding us would change to some extent.